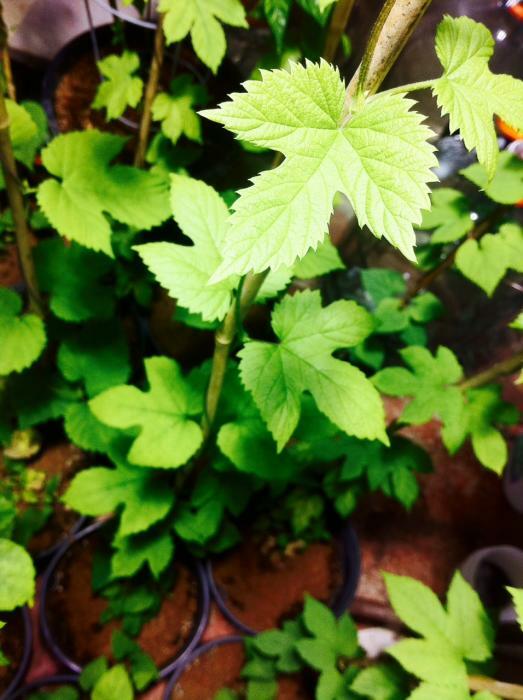 This is a continuation of the hop breeding experiments that I first wrote about in 2013. 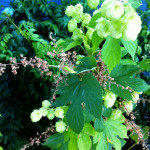 If you are wondering why someone would bother growing hops from seed – go check out that post. Last year, I was fortunate to start a few plants from native neomexicanus seed obtained from plants growing wild in Wyoming and Colorado. These plants are doing well, but as first-year plants, did not produce pollen/seeds of their own. 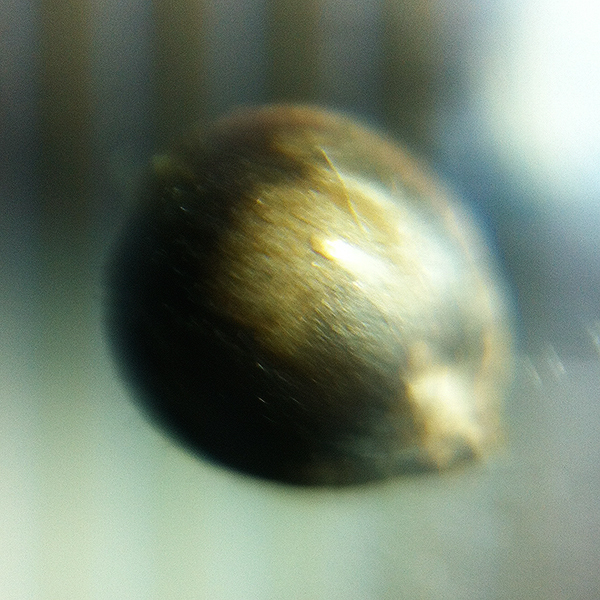 Instead, I was able to obtain pollen from a female hop plant. Yes – a female plant! 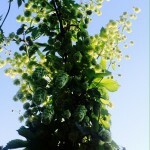 Under stress, many hop plants will throw male flowers. This “gender swap” is a survival tactic for dioecious plants in times of drought or other environmental problems. It can allow them to create offspring, even when no other plants are around. 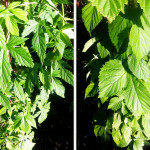 Growers of hops close cousin, cannabis, will often stress plants to create feminized pollen for breeding purposes. However, with hops, this pollen is rarely viable. As a commercial grower told me: “the monoecious plants never have viable pollen… Though in botany, you should never really say never”. And, for the most part, I found this to be true. Many previous experiments with feminized pollen failed to produce any seeds. In 2013, I decided to try again. This time, with pollen collected from various sources. Only one set of the pollen resulted in any seed formation – it was from a naturally stressed Magnum plant. The pollen was applied to a burrs (immature cones) on each of my plants with a small brush. Paper bags were used to mark the pollinate cones and keep them isolated. At the end of the year, many of the cones contained seeds! Out of the seeds collected, many were not viable – being soft, or even hollow. The others were sorted, sterilized and placed in the refrigerator to stratify. After nearly 4 months they were placed in soil to sprout (2014-02-11). Before planting, the seeds were examined for signs of life. 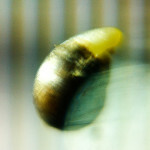 Several of the seeds had indeed already started to sprout – very exciting! I will continue to update this page as thing progress. 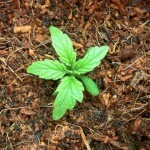 The germination rate was around 50%, though more may still sprout. Out of that, about 20 of the young seedlings are thriving. Many have already developed their second sets of leaves. There is also one very special sprout in the group. This happy little mutant popped open with four cotyledon (rather than 2) and continued on to develop four true leaves at the first node. We’ve nicknamed her “Hydra”. From what I can gather, quadrifoliate traits can be attributed to either genetic mutations, or environmental factors during seed development. If the latter is true, she’ll probably revert to a bifoliate pattern at some point – but, we can always hope. 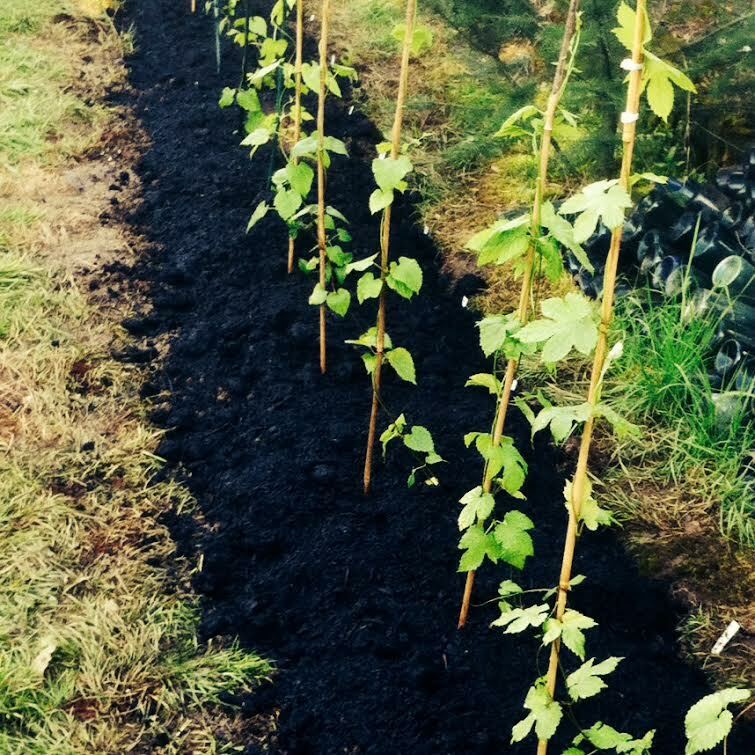 Many of the plants have been moved to another location and planted. This hop yard has a 60′ run with posts holding 1/4inch cable up about 12′. The hops will outgrow this structure, but for for the first year or two, this should be fine. 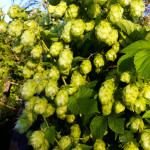 Most of the hops in the yard have maturing cones. Several of the crosses initially sprouted male flowers, but now even those have female flowers. We have started replacing those with the ones that were still in pots. 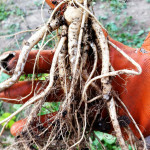 I was amazed at the size of the rhizomes and felt a bit bad killing them – however, we have to culling at some point. The yard is just not big enough for all the plants. There are several promising new plants. One is covered with large, heavy cones. The largest ones have an elongated torpedo shape and are overflowing with neon yellow lupulin. Being a first year, it is probably not yet reflecting the full aroma… but it already has a strong citrus/spicy scent. 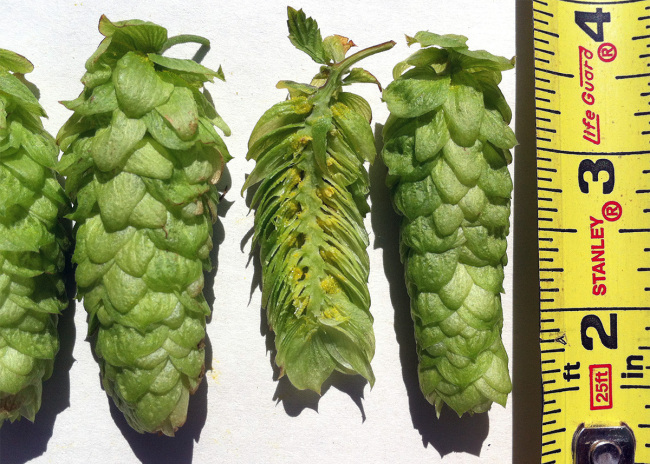 To help me track things… NHB = Nagmay Hop Breeding. 001-004 were sprouted last year. I have been following your posts with great interest and look forward to seeing your results. I would love to do something similar. would you be open to trade or swap for a few seeds? I live on the otherside of the world and hop plants are not available out here, hence my asking. Email me if you are keen. All the seeds are planted for this year, but I would be open to trading pollen/seeds at a later time. I’ll contact you directly to get more info. I am so glad someone is taking a lead in this at a more approachable level. I am the one who wrote the names from Homebrewtalk. 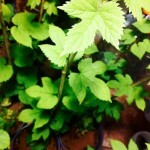 Always glad to meet someone else breeding hops! This year (2015) is when the exciting stuff happens. We’ve have the 8 potentials from last year going strong. in the fall, we hope to get some chemical analysis and do more brewing. I’ll let you know if we find anything exciting. You’ve got an impressive program going, I wish I knew more about the actual genetics and how they combine instead of just hoping for the best. How much does the analysis run you? I’d be curious to see how much the wild/Centennial cross has retained Centennial attributes. 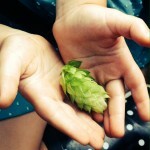 While I love to track the lineage, “hoping for the best” is the name of the game with hops. Since they do not grow “true” from seed, you are simply looking the special ones that pop up. 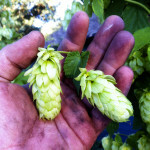 There are several labs that offer hop analysis. Usually runs $30-100 depending on the detail you want. 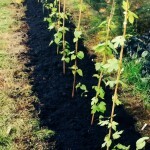 Forgive my naivete per growing hops from seed. 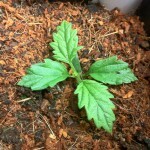 I have a question regarding your seedling vigor. My students (high school garden club) collected seeds from the hills west of Pueblo, Colorado, and have been successful in germinating a few seeds. The plants are now about 8″ tall, but only have a single set (not lobed) of leaves at the nodes, I noticed your plants out of the ground were already a tri-lobed leaf. Very cool. I would love to see a picture. If you look closer, you’ll notice the young seedlings do start out with single (non-lobed) leaves. After that, they tend to start growing leaves with 3 or more lobes. Perhaps yours aren’t getting enough sun… or maybe it is just the variety. hard to tell without a pic.